I already checked my set timezones in both the client and CMS, all are in sync and same timezone, but still the issue persists. I already tried restarting the client and the client machine, but still the issue persists. I also tried “VERIFYING” all module, but still no luck. Please see attached screenshot for visual reference. I’m not aware of a specific bug, but 1.8.2 is now 8 minor versions out of date, so you might consider upgrading to 1.8.10 too. Alright, we’ll try to upgrade and see what happens. No luck, for the changing of offset. I already tried later dates like August 20, but still no luck. 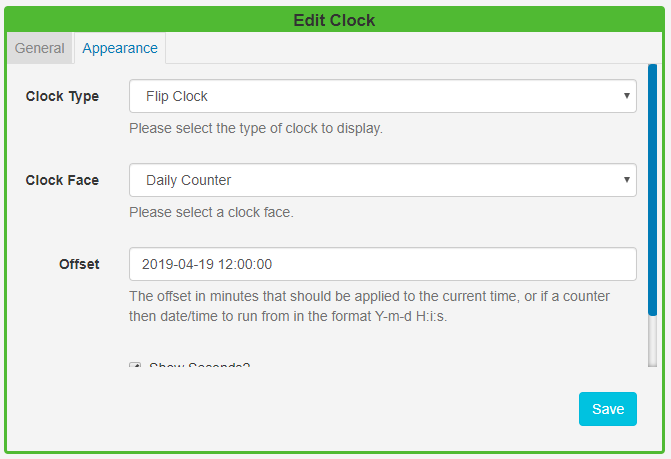 I also tried to check the FLIPCLOCK file (.htm) under the Xibo library in the client machine, and its running perfectly. 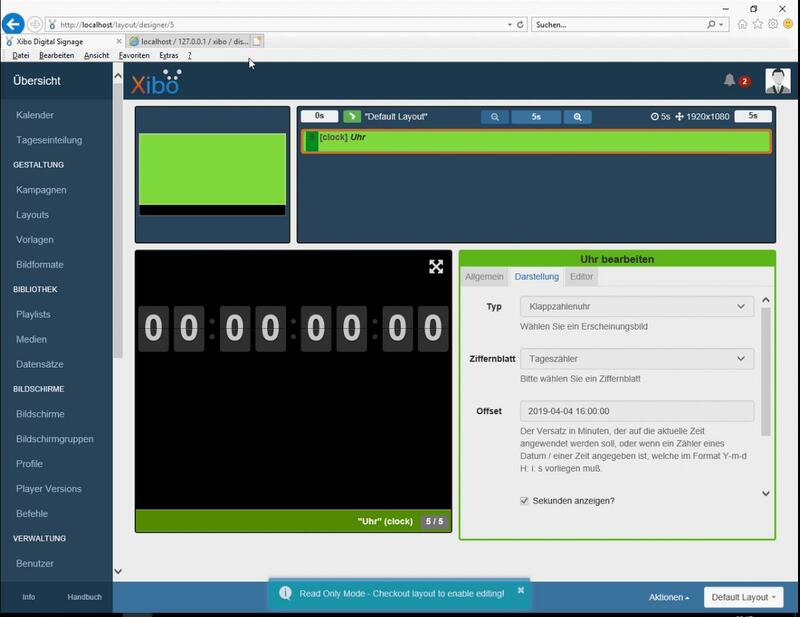 I don’t know why the clock is not working, when viewed in the Xibo Client. I’m no expert and it sounds to me like you know more about this than I. 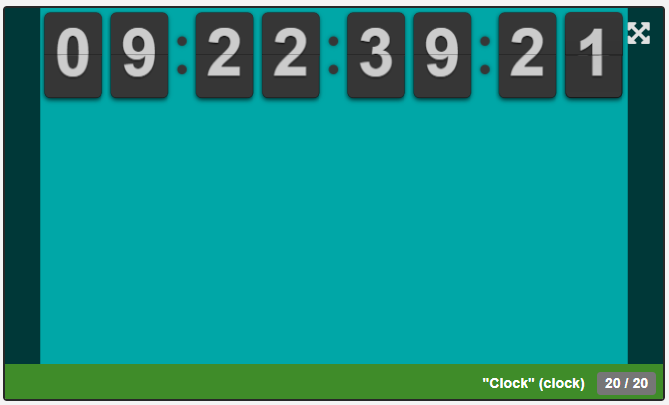 But I was able to get a countdown working by setting the duration to however many seconds I needed it to count down. Hopefully this is what you were looking to do. I haven’t thought of doing that, let me try it next time! But I think we have different requirements, did you try setting the OFFSET with the same pattern as mine?. Thanks for this though, I will definitely try your solution next time! I did try using the offset with the same pattern as you did, but I couldn’t tell it was changing anything. The clock always started with whatever I set the duration as. I’m hoping one day the Clock widget will have a timer option and allow you to set a future date and time and will automatically calculate the time that needs to be displayed on the timer. I dont know, but it seems to be a new bug/issue in the new 1.8.12. release ? 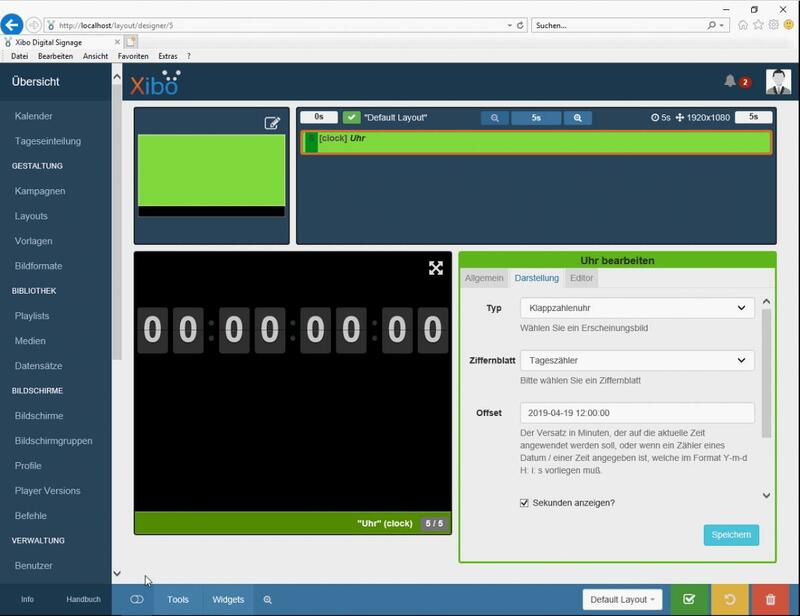 The Flipclock in the preview works fine, everthing is ok, but on the Client it shows only 00:00:00:00. Have anybody the same issue? I have been trying to replicate the issue you described but without success. Can you send me an exported copy of your Layout in a private message so I can try your Layout on my setup? My apologies for any inconvenience while this issue is resolved. I dont know, but it seems to be a new bug/issue in the new 2.0.0. release ? The Flipclock dosen’t work in preview. It shows only 00:00:00:00. Thank you for your message. 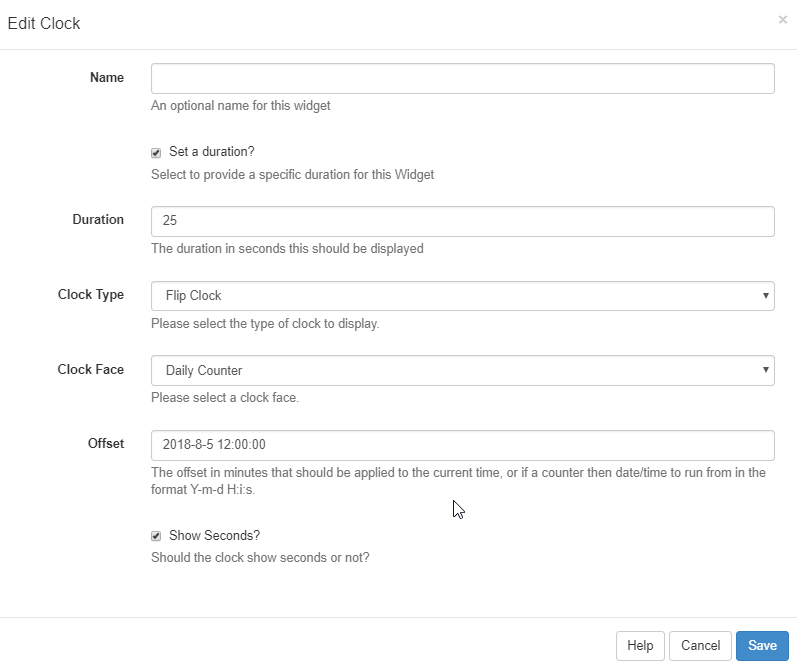 I have created a Flip Clock with the below settings in CMS version 2.0.1 and found that it is showing the countdown without issue. I have also set the Clock Face to 12h Clock and 24h Clock without an offset and was able to see the time in Preview layout. I would recommend upgrading your CMS to 2.0.1 to see if this resolves the issue. 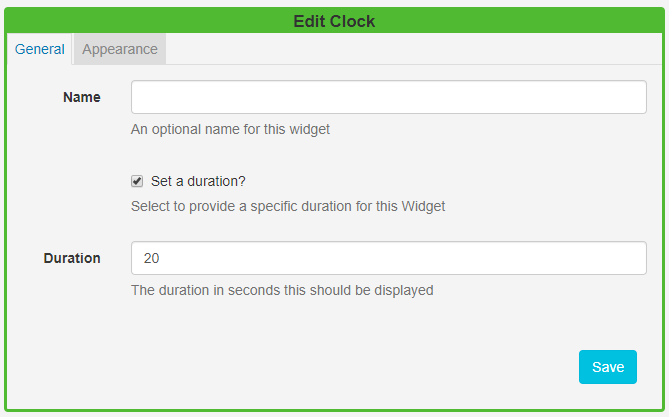 If it does not, please post the settings for your Widget as well as a screenshot of the zeroes you are seeing. I create a layout with one region, an put the clock widget in it. 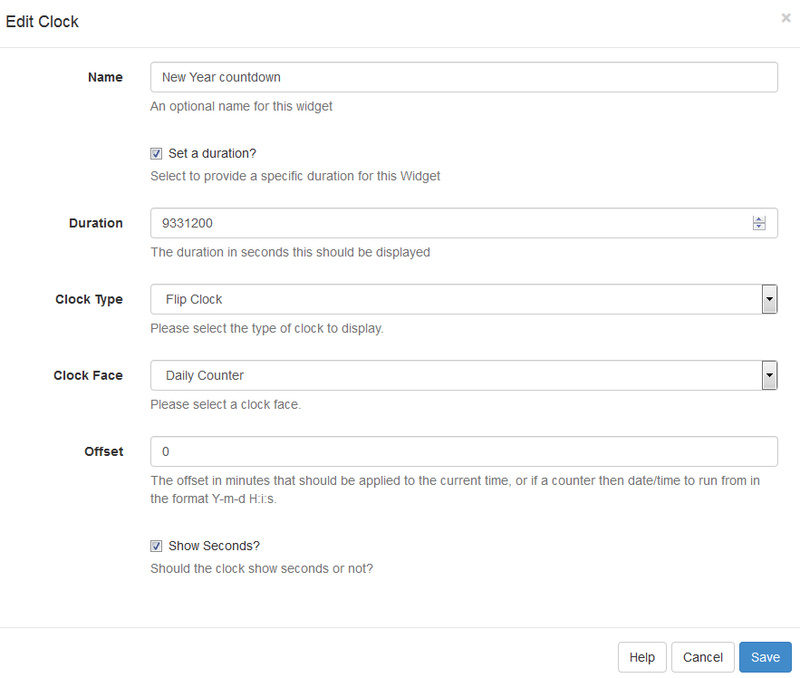 Then i create a layout with a flipclock like the same settings as above. 00:00:00 in Previemode, in the Preview and on the Display. Work worse than befor in Xibo 1.8.12. 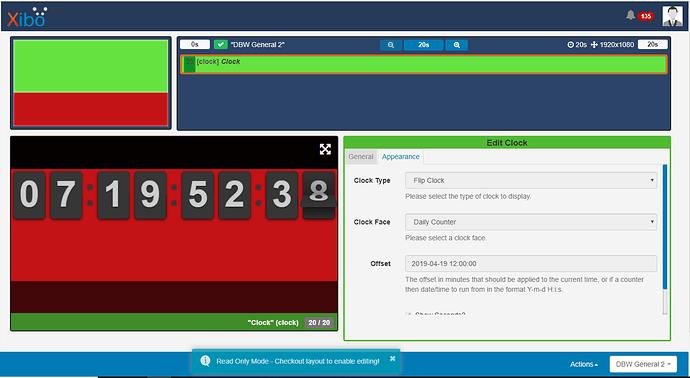 If you want i can send you the layout to do some testings? Thank you for the message and further information. You are correct that the V2-200 Player is also affected. 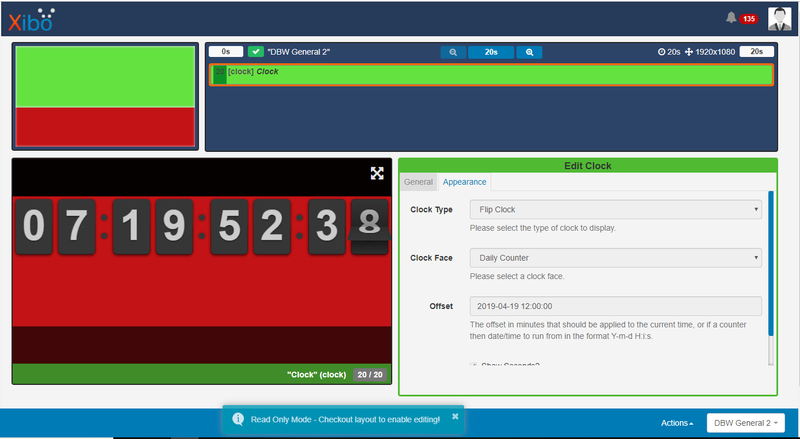 A fix is currently in development and will be included in a future release of Xibo. Once again I appreciate the information you provided.